Is there anything more beautiful than Pesach? It’s all-inclusive and multi-generational. No matter what their level of religious observance, anywhere and everywhere in the world, Jews of all stripes sit down with their families for the Pesach Seder. The magnitude of that is completely awe-inspiring. Perhaps more than any other Jewish holiday, one feels a sense of redemption and destiny, and that one is a tangible link in the chain of the Jewish people since Sinai. It’s not just some esoteric platitude, it’s a connection to the past, present, and future made so very real. Since our first year of marriage my husband has conducted our Seder. 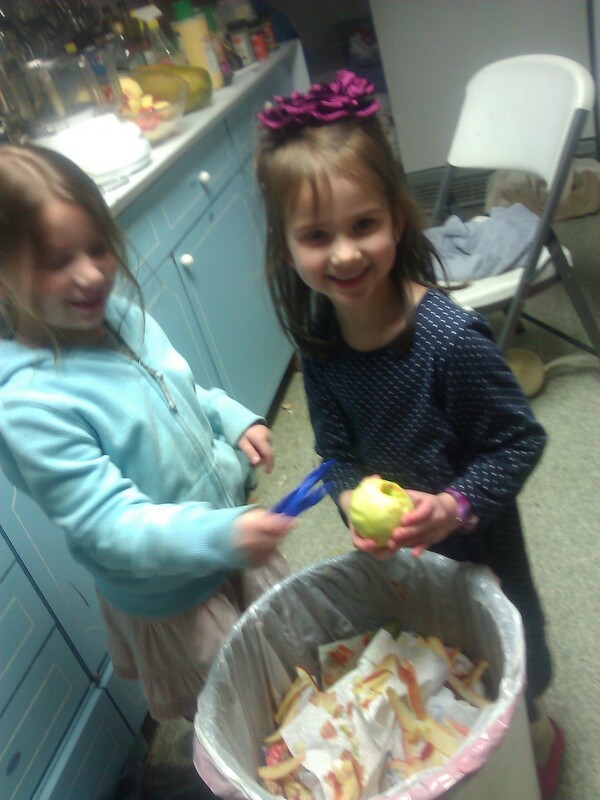 But three years ago, about a month before Pesach, my daughter called. 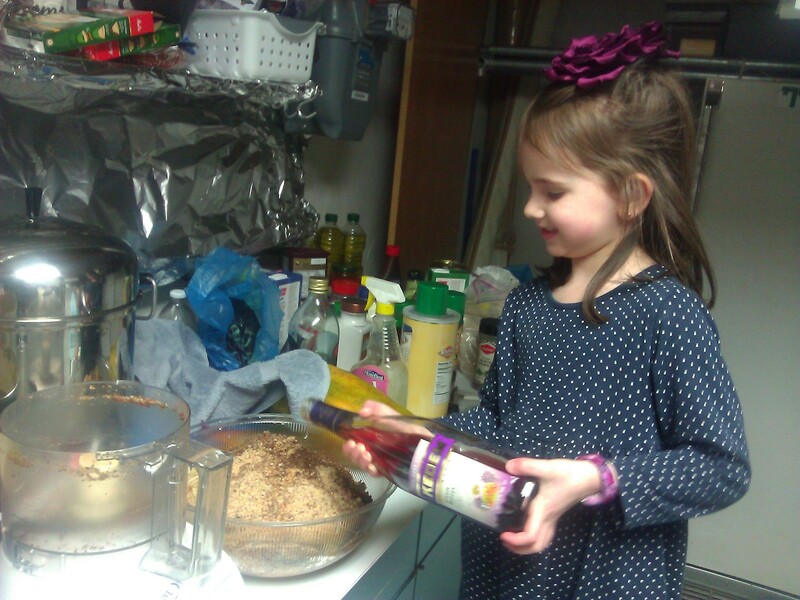 “Would you mind terribly if we made the Seder at our house this year?” she asked. She has a lot of little kids, and the thought of walking 1.25 miles from our house back to her home at 1 a.m. with overtired, cranky kids was completely overwhelming (as of now she has seven children, and the oldest is 12 years old). And so, for the past 3 years, it’s my oldest married daughter and her husband that have been the hosts for the first two nights of Pesach, with my son-in-law leading the Seder. Post-Seder, on the first night, it was my husband and I who were walking the 1.25 miles back home at 1 a.m. We didn’t mind: after a long evening and a heavy meal, it felt good to walk in the brisk air. I thought about my husband’s comments. I’m sure many lesser “patriarchs” might have wounded egos or hurt pride, but in fact, my husband’s words were sincere and I agreed wholeheartedly. May all Jews everywhere spend Pesach next year reunited in the holy city of Jerusalem. 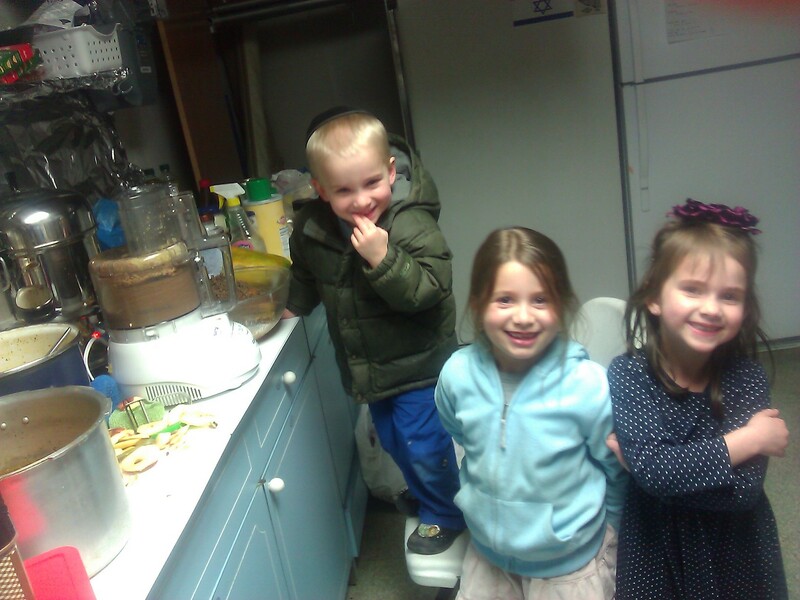 Now back in my hometown for Passover, it was time to make charoses. 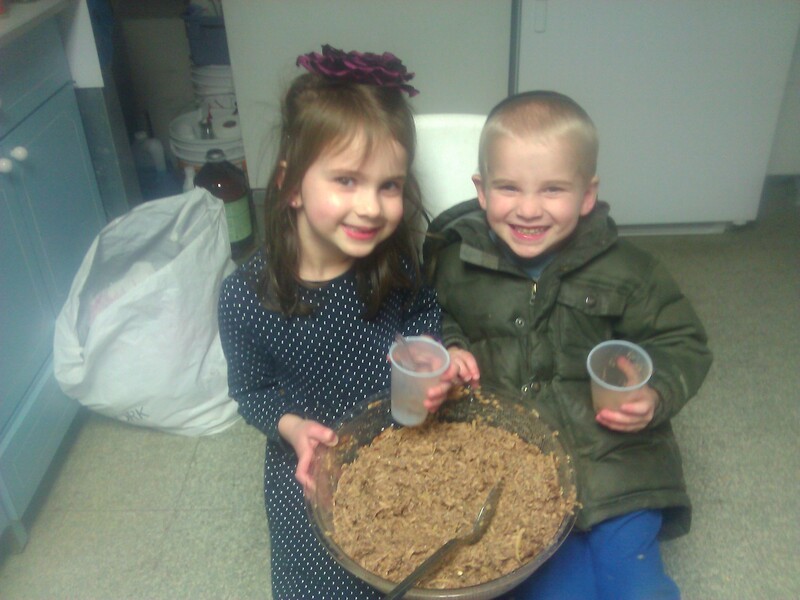 For the uninitiated, charoses is one of the traditional foods eaten at the Pesach seder. It’s meant to represent the mortar used by Jewish slaves in building the pyramids under their Egyptian taskmasters. It seems like every family has a different recipe for charoses. Sephardic Jews often add dates, nuts, wine, cinnamon and ginger to the grated apples; most Ashkenazi Jews use apples, cinnamon, wine, and ground walnuts or almonds. But my mother’s a”h recipe called for raisins as the secret ingredient. Making charoses was practically a whole-day project, or so it seemed when I was a little girl, but one that I looked forward to the entire year. We made enormous quantities of charoses since not only did we have at least 30 people at our seder, but we liked it so much we noshed for the entire week of Pesach. First, we would buy whole walnuts. We would spend a few hours cracking the nuts and separating the meat from the shell. Along with the walnuts, raisins and red apples would be fed through a grinder in alternating batches. The grinder was powered by a hand crank and lots of elbow grease, and this too seemed to take forever, but in a good way: everyone in the family was involved and it was a relaxed, happy time. Finally, after the cinnamon had been added, sweet red wine (the really syrupy stuff that resembles Robitussin) would be added in. Of course we’d all have to take multiple tastes to ensure the mixture was just right. Over the next few days, as the apples absorbed the flavors, more wine would be added, until an entire bottle had been emptied. 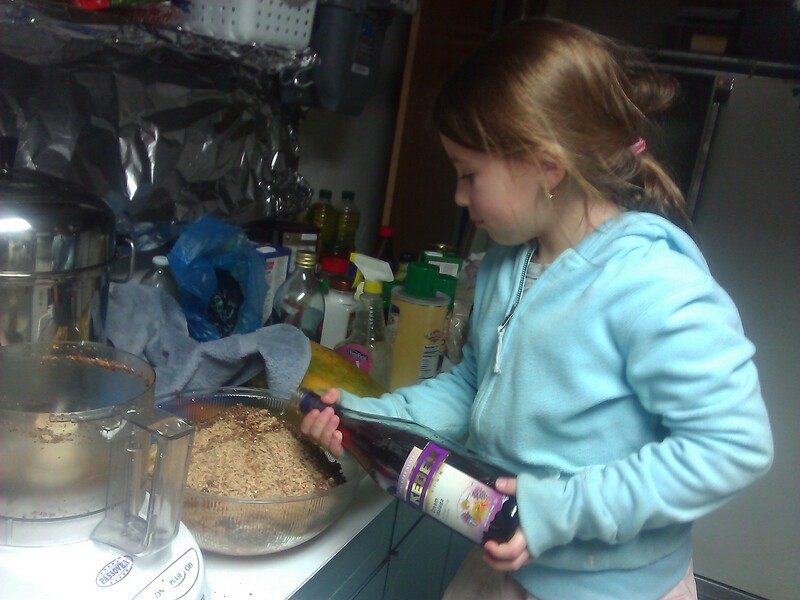 The stirring, adjusting, and adding took five days, right up until the Seder night. Adding wine . . . The process for making charoses has changed. It’s a lot faster and easier now with a food processor and tastes equally delicious, but some of that old-time taam (flavor) has nevertheless been lost – – everyone is so busy and pressured and of course my mother is gone, too. But I do invite my grandchildren to make charoses with me, and they enjoy the experience. Hopefully they will pass on both the family recipe and the charoses-making tradition to their own grandchildren some day. When I went to my Tai Chi class, held in a small town “recreation center” which is really just a basketball gym in an old, crumbling clapboard building, I noticed several crayon drawings posted on the bulletin board. The artist was clearly a preschooler. Apparently, the night before, there had been a pickup basketball game, but one of the guys, a single dad, couldn’t get a babysitter, so he brought his daughter along and sat her down next to the bleachers with a box of crayons and paper. He told her that if she was a good girl and let daddy play without interruption, he would show off her work to the multitudes. There was a crude stick figure that was a partial amputee (one of the arms had been forgotten). The “person” might have been a difficult call gender-wise if not for the crown at the top of a lopsided circle, and two giant loops at the side of its “head.” The loops looked like long doggy ears, which was clearly the source of my classmate’s confusion. “Yeah, we also have the princess obsession,” I said, “although I confess, they’re really much more into dressing up as brides,” I replied, thinking of our recent spate of Purim costumes. I thought a lot about what she said. The definition of a nuclear family has become so blurred in the secular, Western world. Expectant moms are often single by choice and an “ideal” family doesn’t necessarily translate into a mother-father-child combo . No mother today asks her young daughter “what do you want to dress up as?” and expect to hear “a bride!” as the answer. Princesses (She Who Must Be Served) rule. Unlike when I was a little girl, today’s young women may say they want to be lawyers, doctors, or construction workers, which is great. But “bride” is no longer a “required” part of that equation as the be-all and end-all goal in a young woman’s life. In the Jewish world, the concept of a family unit consisting of father, mother, and child is still very strong. On the downside, within the Orthodox Jewish milieu, the desire to be a bride trumps just about everything else, and young Jewish women may feel panicked and obsessed if they’re not engaged by age 24. In my granddaughters’ classes (preschool and 1st grade), there were a few Queen Esthers dressed for Purim; a butterfly; and a ballerina or two; but overwhelmingly the most popular costume was to dress up as a bride. Because Maine’s famous Maple Syrup Sunday falls the day before Pesach this year, I will already be back in my hometown. 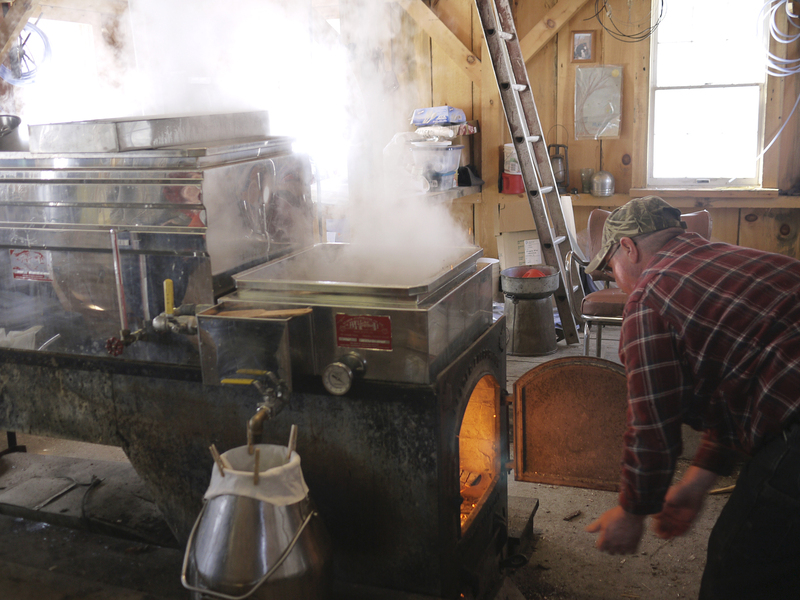 On Maple Syrup Sunday, sugar shacks throughout Maine open their doors to the public for tours of their farms and syrup-making operations. Besides free tastings (you haven’t lived until you’ve tried boiling maple syrup ladled on snow), they often have pancake breakfasts (not kosher) whose proceeds go towards local charities. 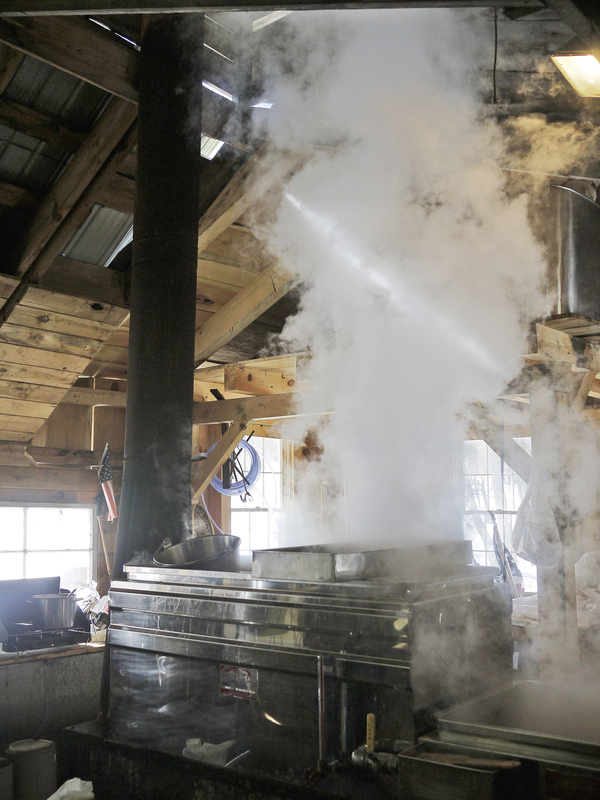 But the sugaring season started about a week ago, and it’s already possible to buy freshly made syrup from sugar shacks and farm stands, albeit without the bells and whistles associated with Maple Syrup Sunday. Yesterday was such a beautiful sunny day, I decided to visit 3 different sugar shacks and purchase syrup from each, since in any case the sugaring season is short and ideal weather conditions (cold nights and warm days) will not last forever! You may be wondering, “Why go to more than one sugar shack? Doesn’t all maple syrup taste the same?” but like wine, maple syrup varies in taste, quality and grade based on the location of the trees, weather, and technique. Early in the season, the sap is lighter in color, with a more delicate, mild flavor (“Grade A Fancy: Light Amber). A couple of weeks later, the sap’s color changes from light to medium amber, and is more viscous (Grade A: Medium Amber). Towards the end of the season (2 – 6 weeks long, depending on weather conditions), the syrup is Grade B: Dark Amber with richer, more flavorful body – – a bit too strong for pancakes but suitable for use in baking. Once the days warm up sufficiently for buds to appear on the maple trees, the season comes to an abrupt halt, as the formation of buds alters the quality of the sap dramatically. Not only is the flow of sap greatly reduced, but it becomes bitter instead of sweet. When I went to McAllister’s sugar shack in Waterford ME, I was pleasantly surprised by how light-colored the syrup was. But unfortunately the price was prohibitive – – $80 a gallon! – – so I settled for a quart for $20. 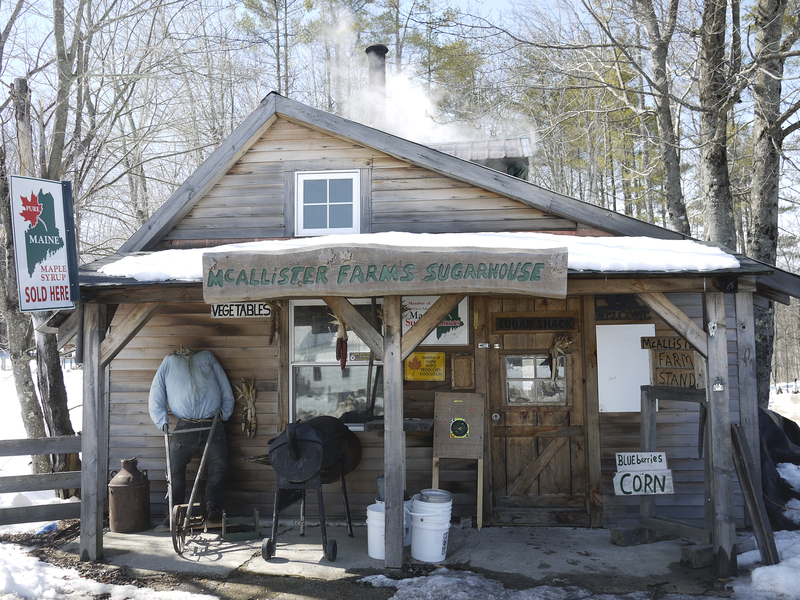 The proprietors – – like most sugar shacks, a family business and extension of their farm – – had been feeding the wood-fired stove and tending the evaporator for hours. Steam rose in great billowy clouds to the top of the pine board interior of their large cabin-sized shack, perfuming the air with the scent of sweet maple. The other two shacks I visited were not nearly as appealing. One fellow’s trees had already budded, and his syrup was thick and dark as molasses. It was fine for use in baking, but not so tasty for use on pancakes. The other was producing the medium amber syrup, which is the most common grade available, but it could not compare to the syrup from McAllister’s shack. When I returned from my syrup shopping excursion, my husband and I went on a hike through the woods on a snowmobile trail. Although we heard several snowmobiles in the distance (they are really just glorified motorcycles on skis), none came our way. The snow is melting quickly now with only about 4 slushy inches left on the ground – – we were glad we had carried our hiking poles to keep from slipping and sliding. Although there are still ice fisherman out on the lakes, I keep wondering when I am going to hear about the inevitable shack that plunges into the water because its owner waited a little too long before spring melt to remove it. Spring mud season is coming! 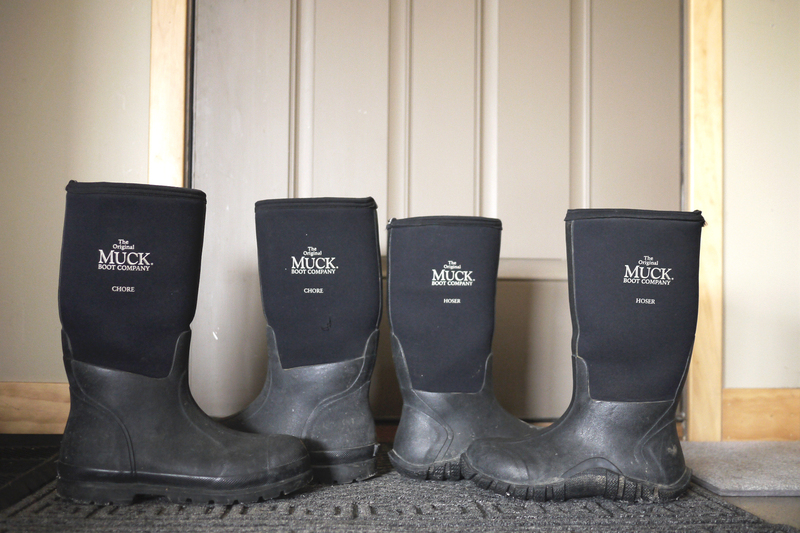 My Muck Boots stand at attention by the front door. Muck Boots are de rigueur in Maine during mud season. They are worn by farmers, woodsmen, and homemakers alike. They are made of heavy rubber and neoprene and are completely waterproof (and are quite comfortable). They are worth every penny – – you just hose them off when they get covered in mud and they are as good as new. They also keep your feet nice and warm in cold weather. They can take all kinds of abuse and seem to last forever. After two weeks of cloudy skies, we woke up to bright sunshine and brilliant blue skies. Although the forecast said it would be 45 F over Shabbos, we were surprised with 61 degrees! I set up a chair outside to soak up the day’s warmth and when not reading, I enjoyed listening to the quiet and looking out into the woods. My dog sat about a foot away from my chair, when suddenly a little black field mouse scampered between us. My dog lifted his head in surprise, but looked at me with an expression that seemed to say, “Nah, not worth it.” And so the mouse lived to see another day. The warmth meant that cluster flies’ larvae hatched. Cluster flies look exactly like common houseflies, and as far as I can tell they do not bite. What makes them odd is how slowly they fly around, almost clumsy in slo-mo and masochistically easy to swat when they come into the house to annoy us. In the midst of my lazing around I suddenly heard very loud buzzing. I thought it was the cluster flies, but upon closer investigation I realized that the strong sunshine had warmed up the beehives and for the first time all winter, the bees had exited their hives and were foraging. Unfortunately for them, there is simply nothing for them to forage – – there is no pollen nor flowers as yet, and they were angry, tired and weak. One that flew near me plopped to the ground, wobbled a bit like a disoriented, drunken clown, and after a few tries managed to get airborne again. There is still honey and some supplementary sugar paste in the hives which served to nourish them over the winter, so for those strong enough to find their way back to the hives, they would survive their premature exit. I cannot help but wonder about all those who were not so lucky. I walked quite a bit this Shabbos, trying to make the most of the glorious day. 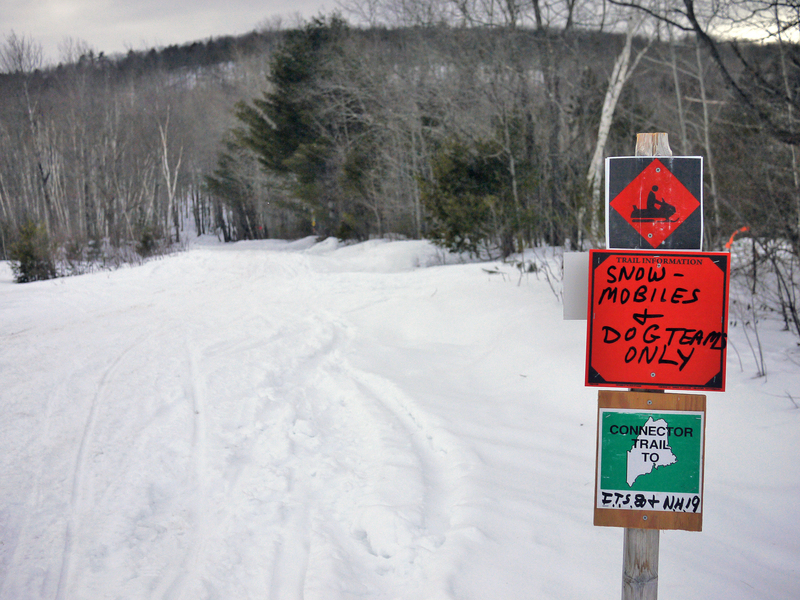 The snow is thin, especially along the well-used snowmobile trails, and I suspect tomorrow will be the snowmobilers’ last day till next winter. While out and about a fellow on a snowmobile stopped to talk to me. I couldn’t really see who I was talking to, since he was wearing dark goggles and had on a full helmet. “Was there enough snow on the trails?” I asked. The man answered me and I really had to strain to understand his thick Maine accent, but I still missed much of whatever he had to say. Suddenly I realized he wasn’t talking about snowmobiling at all, but maple syrup. And then he said, “By the way, my name is Buck.” He pulled off his helmet and I realized it was the fellow I met at the local library this past Tuesday. In a conversation I’d eavesdropped upon, he mentioned that his “trees were running well” which means that the syrup was flowing from his tapped sugar maple trees. I stepped forward and asked him if he had any maple syrup to sell and he said I was welcome to come by later in the week when the syrup-making was further along, He’d tapped 72 trees so there should be plenty of sap this year, he said, and the warmer days and cold nights of the past week were ideal for a high yield. And that was no small thing, here in rural Maine. I’m now back in Maine: YAY! While in the post office yesterday, it became clear to me that not everyone is as excited by winter as I am. Perhaps it’s because I was gone for a month and missed the cruelest part of winter (it was -30 with windchill); but I still get excited with every bit of snowfall. Thanks to the woodstove, our house is always nice and toasty, and we really are at the stage where the weather can’t quite decide if it’s the end of winter or beginning of spring – – temperatures continue to hover just above or below freezing. Hopefully we can avoid a lot of sleet, which is never fun, and of course, once the melt begins, we have mud season to look forward to. 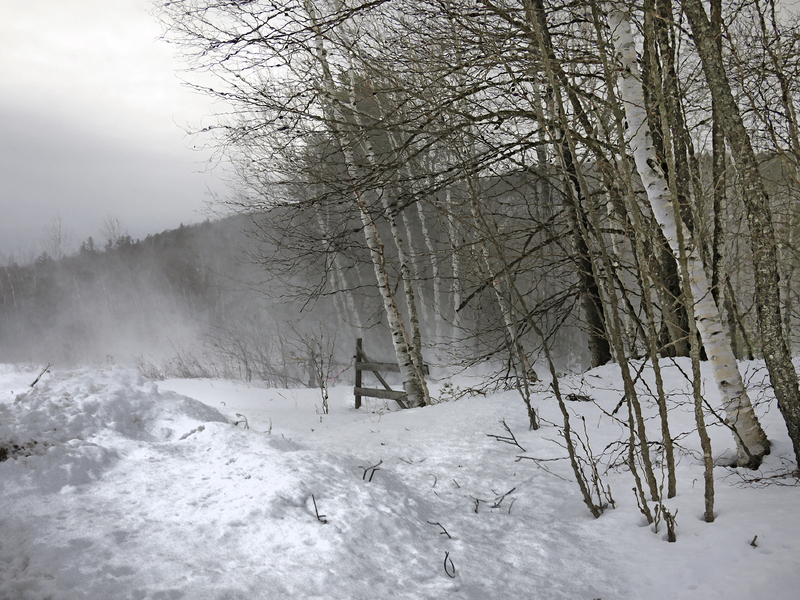 But for now, there is still ample snow on the ground, much to the delight of snowmobilers and dogsledders who love to explore the wooded trails that crisscross the White Mountains. People often ask us if we are bored on Shabbos. It is very quiet, but never uninteresting or unenjoyable. This is actually a busy time in this part of the woods, and there is more traffic than usual (in summer we get an average of one car per hour down our road, if that). While out for a walk this past Shabbos, we saw at least a dozen snowmobiles, plus a dog team of 6 American Eskimo, Husky, and Malamute dogs pulling a sled with a “musher,” his wife , and their preteen daughter. Of course we stopped to chat – – that’s just what you do in Maine. We also met up with the law enforcement side of the forest service – – a game warden. We spoke with him as well, and he told us that they patrol the trails (on snowmobiles, of course), checking snowmobile registrations (you have to register your snowmobile much like you register a car) as well as ensuring that snowmobilers are sober and safety-conscious. Just down the street from us, we drive down this six-mile-long road, which leads to Evans Notch in New Hampshire, all summer long, but it’s open only to hikers, snowmobilers and dogsledders in the winter. Think of this scene the next time you are stuck in city traffic! She regaled us with stories of her “Grampy,” who lived in Norway, ME (about a 30 minute drive from here) his entire life. He had worked for decades at a wooden dowel factory. It was his custom to walk home for lunch. After a perfect on-time attendance record, one day he was 15 minutes late getting back to the factory after lunch. He was so mortified, he figured if he couldn’t walk fast enough to get back to work on time, he wasn’t good for anything. So he quit that job on the spot! “That’s when Grampy was 89,” Laura added. Life is awfully good here in Maine.